In consideration for me, or the minor child in my care, being permitted by the Fun Ones Moon Jump, Inc. to participate in the use of the equipment and/or attractions, I waive, release, and discharge any and all claims for personal injury, death or property damage which said individual may sustain or which may occur as a result of the individual’s participation in said activity. This release is intended to discharge in advance the Fun Ones Moon Jump, Inc. (its officers, employees or agents) from and against any and all liability arising out of or connected in any way with the participation of the individual in the said activity(ies), even though that liability may arise out of the negligence or carelessness on the part of the Fun Ones Moon Jump, Inc. (its officers, employees or agents). Each of us understands that the described activity may be of a hazardous nature and/or include physical and/or strenuous exercise or activity; that serious accidents occasionally occur during the above described activity; and that participants in the described activity occasionally sustain mortal or personal injuries as a consequence thereof. Knowing the risks involved, nevertheless each of us agrees to assume all risks of injury and to release and hold harmless the Fun Ones Moon Jump, Inc. and __Highcrest PTO_ (its officers, employees or agents) who through negligence or carelessness might otherwise be liable to me or said minor child. It is further understood that this waiver, release and assumption of risk is to be binding on the heirs and assigns of the undersigned. Each of us further agrees to indemnify and to hold the Fun Ones Moon Jump, Inc. (its officers, employees or agents) free and harmless from any loss, liability, damage, cost or expense which they may incur as a result of any injury and/or property damage that I or said minor child may sustain while participating in said activity. This agreement is intended to be as broad and inclusive as is permitted by law. If any provision or any part of any provision of this Agreement is held to be invalid or legally unenforceable for any reason, the remainder of this Agreement shall not be affected thereby and shall remain valid and fully enforceable. To the fullest extent allowed by law, I agree to WAIVE, DISCHARGE CLAIMS, AND RELEASE FROM LIABILITY the Fun Ones Moon Jump, Inc. (its officers, employees or agents) from any and all liability on account of, or in any way resulting from Injuries and Damages, even if caused by negligence of the Fun Ones Moon Jump, Inc. (its officers, employees or agents) in any way connected with this Activity. I further agree to HOLD HARMLESS Fun Ones Moon Jump, Inc. (its officers, employees or agents) from any claims, injuries, damages, or losses caused by my own negligence while a participant on the Activity. I understand and intend that this assumption of risk and release is binding upon my heirs, executors, administrators and assigns. I have read this document in its entirety and I freely and voluntarily assume all risks of such Injuries and Damages and notwithstanding such risks, for myself or the listed minor, who is in my care, to participate in the Activity. Luau Madness wristbands are now on sale! We will be using the AtoZ storefront to sell the wristband. Click here to purchase wristbands. Please choose Highcrest as your school if you have students and multiple schools and you will be taken to the AtoZ storefront- you do not need to have access to the AtoZ directory to purchase a wristband. Luau Madness is the first product listed under events. You do not need a PayPal account to purchase wristband. Click on PayPal and you will see an option to use a credit card. (Please click on login reset if you are unable to access and need a new login) We also need volunteers to make this fun event run smoothly. Click here to view the SUG. We really appreciate all of your help. This is a fun event for both parents and students. Wristband sales will shutdown on Thursday evening around 6 pm so we can finish sorting the wristbands. Wristband sales will reopen on Friday morning but will not be distributed to homerooms. Please contact luaumadness@highcrestpto.org with any questions. Yearbooks orders can be placed online through the Jostens website. Click here to order. Questions? Email LesleyShifrin@gmail.com (5th grade) or TerriBielinski@gmail.com (6th grade). Stay Cool in the Highcrest Spirit. 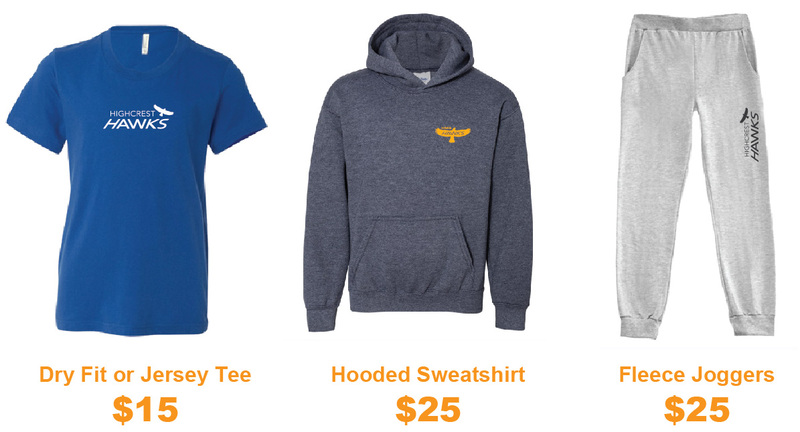 Keep Warm in HAWKwear! Buy 2 or more- ONLY $10 each! Freaky Friday, the PTO- sponsored, Halloween-inspired fall party will be 6-7:30 p.m. October 19th, 2018, at the school. The event features carnival games, inflatable rides, bouncing, dancing, a photo booth, and much, much more. This event is open to all HMS students. Tickets can be purchased for $15 online only. Want to witness the fun? Please don’t forget to sign the waiver (You don’t need to type in guest name in the middle of the waiver, just read and scroll to the bottom and complete the bottom portion including your signature. Then click on the agree and sign icon in the lower right corner and the waiver is all set) so your child can participate in all of the fun activities! REGISTRATION WILL CLOSE AT APPROXIMATELY 6:00 PM O THURSDAY SO WE CAN SORT THE WRISTBANDS. We will reopen registration on Friday morning but please register by Thursday if possible. Volunteer and help make this a great event! Online wristband purchasing for Freaky Friday is closed. If you wish to buy a ticket, come with your child to the party entrance at 5:45 p.m. Friday to sign the waiver and purchase admission. District 39 Educational Foundation offers non-competitive courses ranging from Disease Detectives to Roller Coasters to Bottle Rockets and more. Registration will occur in late fall for winter classes. Last year, over 100 students participated in 13 STEM (Science, Technology, Engineering and Mathematics) enrichment courses taught by volunteer leaders from the D39 community, many of them practicing scientists. Students designed and built robots, identified the perpetrator of a crime, explored the solar system with a NASA scientist, built working musical instruments, just to name some of the amazing opportunities available with Science Olympiad. The Foundation is proud to offer this nationally acclaimed program to HMS and WJHS students, and it would not be possible without the wonderful group of volunteer leaders and teachers. Plans are underway for another exciting year of enrichment. Registration will begin in October. Enrollment is limited and courses fill quickly. Information will be available on the Foundation’s website. Show your school spirit on HIGHCREST HAWK FRIDAYS! NEW HawkWear for sale during Orientation, Curriculum nights, and PTO coffee meetings. Past spiritwear items, limited quantities and sizes, also available. Please join us on Friday, September 7, 2018 for a fun-filled day with your 5th Graders! 5th Grade Connections is a field day just for 5th Graders and is organized by each House to help the kids get to know each other better through games and activities. The day is volunteer driven — so we need your help! The event will be a wonderful bonding experience for the 5th graders and a great way for parents to see all the new friends being made. Please select the time slot that matches your child’s House. Specific event details will be sent closer to the date. Contact 5thgradeconnections@highcrestpto.org for more information. Commemorate your child’s birthday by purchasing a book for the Highcrest Library Media Center. • Contact your Green Committee chair to answer any questions. The Highcrest Civics and Safety Chair coordinates civics and safety programs for Highcrest and helps coordinate safety components of other PTO programs. Last May, the PTO contracted with a firm to collect and compost food waste. They collected approximately 750 pounds of food waste in four days, or 187.50 pounds of food waste per day, or .22 pounds per student per day. Freaky Friday is the PTO-sponsored, Halloween inspired fall party on October 19, 2018 from 6:00 – 7:30 at the school, and features carnival games, inflatable rides and bouncing, dancing, photo booth and haunted house and much, much more. This event is open to all HMS students. Tickets can be purchased for $15 online only. Ticket sales will open soon! Come join us in helping make this Freak Friday a great event. Click here to volunteer! Come in costume and ready to PARTY! Questions about the event? Please direct them to freakyfriday@highcrestpto.org. 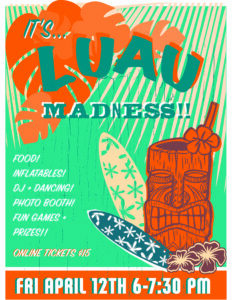 Luau Madness is a school wide spring themed party (spring break/beach and March Madness basketball) for students of Highcrest only.